Bivalve calcification, particular of the early larval stages is highly sensitive to the change of ocean carbonate chemistry resulting from atmospheric CO2 uptake. Earlier studies suggested that declining seawater [CO32−] and thereby lowered carbonate saturation affect shell production. However, disturbances of physiological processes such as acid-base regulation by adverse seawater pCO2 and pH can affect calcification in a secondary fashion. In order to determine the exact carbonate system component by which growth and calcification are affected it is necessary to utilize more complex carbonate chemistry manipulations. As single factors, pCO2 had no and [HCO3−] and pH only limited effects on shell growth, while lowered [CO32−] strongly impacted calcification. Dissolved inorganic carbon (CT) limiting conditions led to strong reductions in calcification, despite high [CO32−], indicating that [HCO3−] rather than [CO32−] is the inorganic carbon source utilized for calcification by mytilid mussels. However, as the ratio [HCO3−] / [H+] is linearly correlated with [CO32−] it is not possible to differentiate between these under natural seawater conditions. Therefore, the availability of [HCO3−] combined with favorable environmental pH determines calcification rate and an equivalent of about 80 μmol kg−1 [CO32−] is required to saturate inorganic carbon supply for calcification in bivalves. Below this threshold biomineralization rates rapidly decline. A comparison of literature data available for larvae and juvenile mussels and oysters originating from habitats differing substantially with respect to prevailing carbonate chemistry conditions revealed similar response curves. This suggests that the mechanisms which determine sensitivity of calcification in this group are highly conserved. The higher sensitivity of larval calcification seems to primarily result from the much higher relative calcification rates in early life stages. 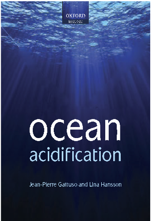 In order to reveal and understand the mechanisms that limit or facilitate adaptation to future ocean acidification, it is necessary to better understand the physiological processes and their underlying genetics that govern inorganic carbon assimilation for calcification. Thomsen J., Haynert K., Wegner K. M. & Melzner F., 2015. Impact of seawater carbonate chemistry on the calcification of marine bivalves. 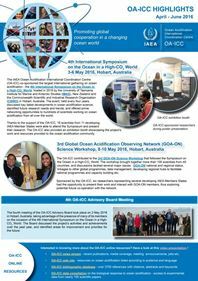 Biogeosciences Discussions 12:1543-1571. Article.